If you have ever had to clean RTV off of a gasketless oil pan, timing cover or other parts, you know how hard and time consuming this task can be. We have found that running a round ball end Allen wrench, where the ball fits the groove in those parts, does the job with ease and greatly reduces the time spent cleaning them. 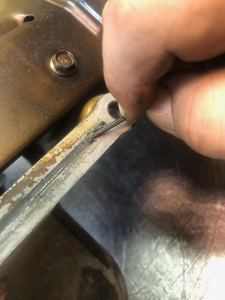 I use a set of machinist transfer punches to help me set up on an existing hole that may have a broken bolt or broken drill bit below the surface. The transfer punch is designed to drop into a hole by specific size, and the center punch can do its job down in the hole. I turn it around and insert it into the chuck of my head shop or mill. Then the back, non-pointed side of the punch, can fall into the hole and give me an exact center on the hole. I use a combined drill and countersink, also called center drills, to start my hole. These are very short and rigid and do not move around. Once my pilot hole is ready, I can change to a longer bit to continue drilling all the way through the broken bolt or stud. 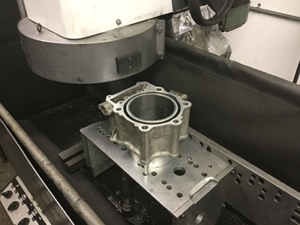 Some single cylinders are tough to mount to a surface machine because of their irregular shapes and lack of external bolt holes. On these, I’ll tap a couple of adjacent head bolt holes and use thread inserts to hold them down from the bottom. As long as you don’t get into dowel pin counterbores, it’s not a problem. I have a flat surface plate I made just to mount things to my surfacer with. Harley heads, snowmobile cases, etc. – anything that bolts down. Here’s an example of how I can surface a freshly sleeved single cylinder on that fixture from the head bolt holes. Dzus fasteners come in various sizes and slot radii. Although tools are available for R&R, many people use screwdrivers, which do not engage fully, can slip, gouge paint and damage the finish. They also do not have enough leverage for stubborn fasteners. 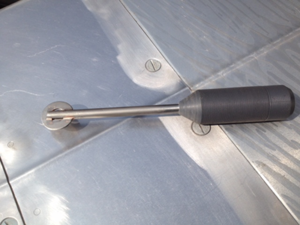 Many of us have damaged or broken screwdrivers that can be modified in minutes to make an ideal tool. Find a washer that fits the fastener radius fully and braze or weld it to the screwdriver as shown (You may need several sizes). This not only creates full engagement, but provides leverage. Sometimes a failure or even a comeback seems obvious and we point a finger at a failure point and assume that it was defective. A little investigating might show a cause and effect scenario and what might be thought of as defective or failing may not have been able to operate properly from the start. This is never more true then in the case of timing tensioners. Most tensioners are simple oil pressure operated pistons. But if they pick up any debris and don’t get full oil pressure they cannot function properly. They may not be able to keep up with engine RPM and timing chain motion. Consider the failed chain guide. Just because these parts are made of plastic does not make them weak. When timing chain tension is maintained, guides should last a long time. If a guide is broken it has taken an impact, usually from a timing chain running out of control. Other timing components such as cam phasers can also cause failures in other components. A failed phaser or the controls for the phaser can greatly affect cam timing. If the camshaft shaft moves too far, valves can and will come in contact with the pistons. 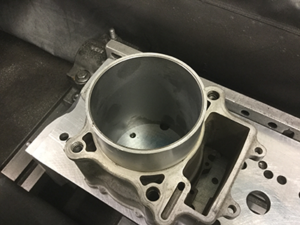 Replace the valves, but make sure the cause of the failure is repaired or replaced. Camshaft failure is often blamed on bad cams but this is rarely the case. Cams are checked long before they get out of the factory door. More likely, camshaft failure is due to either a lubrication problem or a lifter that cannot rotate or has stopped rotating. Lifter-to-bore clearance needs to be tight for hydraulic lifters to work properly. It does not take much debris to come between lifter and block. Even camshaft assembly grease that gets up the side of the lifter might stop rotation. 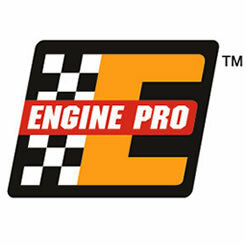 And if an engine does not start quickly and comes up to fast idle quickly, lubrication can be wiped away and hurt the new cam. Lifter internal clearance is very tight, as tight as .0005˝ in some performance lifters. Any debris, even lint from a rag, is larger than this and may cause a problem. This is very true for activating lifters for GM AFM systems, which act as a lifter within a lifter. A faulty AFM controller may starve lifters of the oil pressure they need to operate correctly and will cause a lifter to lock up. The lifter was not defective, it was not under control and following the camshaft while in open position. The abuse it takes will lock it into open position. This may also cause mechanical failure to the cam and lifters. And do not forget that the lifter buckets are designed to direct oil into the lifter and too much clearance may cause a loss of oil pressure to the lifter. Many systems must operate in perfect harmony within modern engines. If one fails, don’t forget to look deep for the cause. Simply replacing a part may allow it to happen again.